Rode NTG3 is a well-priced professional shotgun that boasts stellar sound quality and low self-noise. It is ideal for budget film or field production where you want to get the best sound for the money. It can be a good alternative to Sennheiser MKH 416 because it does almost exactly the same job at a lower price. This mic has RF-bias capsule, which is known as true condenser. This sets it up from entry shotguns (which are all back electret) and allows achieving even better sound while also giving the flexibility to work in humid conditions where other mics fail. The only downside – it requires phantom power to operate! Rode NTG3 is capable of producing a beautiful, natural sound where it’s really hard to find any flaws. It has a flat frequency response with just a little of added brightness that makes it sound a bit more expressive. Very similar to MKH 416, although Sennheiser is a tad brighter, but the sound quality is just about as good. What you will especially love about NTG3 is how it handles the highs – they are perfectly clean! It’s important, because most entry shotguns (e.g. NTG2) do introduce some degree of harshness to higher frequencies, which may be less noticeable though when comparing compressed audio files. The pickup pattern of NTG3 is wider than most entry shotguns, including the most popular MKE 600, NTG4, NTG2 and AT897. The wider pickup makes it a bit less forgiving when an actor goes off-axis and results in less hyped low end when up close due to proximity. On the other hand, it will also pick up a bit more of the background but for booming I’ll take it any time over the above mentioned mics – the cleaner sound of NTG3 is worth it. 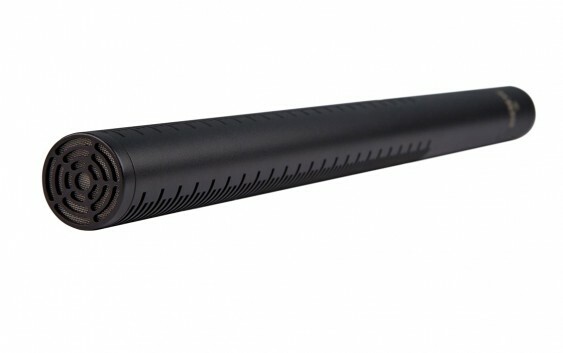 Sennheiser MKH 416 has even wider pattern, which also means less proximity, but by far it also has the poorest rejection than any other shotgun. Although both professional and entry-level shotguns generally use condenser capsules, it’s important to understand the distinction between back electret and RF-bias condensers. They are basically two methods of polarization that apply electrostatic charge to the diaphragm in order to make it sensitive enough for the mic to work. Back electret has some electrostatic material applied to the back of the capsule that gives it a permanent charge; RF-bias or true condenser capsule requires an electric current from the outside to become polarized, and this current is supplied through phantom power. While having certain limitations, back electret shotguns can work on low voltage and they are quite power efficient. For example, NTG2 can work for a couple hundred hours from a single AA battery. On the other hand, true condensers and especially NTG3 are power greedy. Even though it’s possible to connect it directly to digital recorders like Zoom H4N that do supply phantom power – they will be drained very quickly – and the same applies for cameras, so don’t do this mistake! If you want a quick and simple solution for your digital recorder, please consider NTG4+ or MKH 600 instead. If you don’t want to settle for entry shotguns and desire professional sound, here is how you can go about NTG3. You can use a field mixer: those devices fit up to 8 AA batteries and that’s enough to power this and other XLR mics for many hours. Mix if needed, then simply feed it to your recorder. Field mixers are handy for run and gun / ENG, though I wish NTG3 also had some low cut to apply for vocals straight away. Sound Devices produce professional mixers that have very good preamps and plenty of features. If you can afford one, you’ll probably get better results than if plugging to the digital recorder alone. Among cheaper ones, there is Azden. They are basic but they get the job done without fuss. Particularly, I advise FMX-32, which fits 6 AA batteries and offers 3 channels, and should be enough for our purpose. Another option is to get Zoom F8. It is a solid recorder with 8 channels and 8 internal batteries, and it actually replaces the need for field mixer. It also has limiters where you can see immediately what’s going on but unlike mixer, it can record both the mix and individual channels too! If you don’t already own a decent recorder, then going straight for Zoom F8 can be an altogether better solution. Humidity is another reason to choose NTG3 over the entry back-electret shotguns. The problem with back electret capsules is that they cannot stand elevated levels of humidity. If exposed, they will produce lots of pops and crackles, and that is a very ugly thing to hear. Since shotguns are mostly used outside, this can be a huge obstacle. You don’t need to put it under heavy rain to experience that; having some moisture in the air is all it takes. That can also be triggered when someone is really breathing or spitting into the mic. When indoors, you should also be vary of humidifiers. Some places naturally have higher humidity, so take it into consideration as well. Countries with tropical climate or close to equator, especially South East, Central Africa and parts of Latin America are first in the list. Also, be cautious when going to safari or shooting documentaries. Early mornings outdoors, you may get condensate that is very bad for all of your equipment. Fortunately, moisture exposure has only temporary effects and when dried up, electret mics will work again. Yet, this will still hinder your production… meanwhile prolonged exposure of any microphone can cause permanent damage. Rode NTG3, on the other hand, like all professional shotguns has no issues with high humidity. This mic measures 10” long and weighs 163 grams. It has a simple but durable design, no LEDs nor switches to be found. Like all Rode mics, it is covered by extendable 10 years warranty. The cool thing about NTG3 – it comes in a rugged waterproof aluminum case, which feels more like bulletproof… It includes standard foam that will protect it from light wind. If you want a bit more protection, you can get Rode WS7 but for professional mics, I usually recommend getting blimp right away. This will save you from disappointment when someday wind suddenly creeps into your recordings. There are basically two options: Rode Blimp and Rycote Super Shield. Blimp is of course more common because it’s promoted by Rode, but it has two disadvantages. The carcass is made of questionable quality plastic that forms hexagons as you can see on the pictures. After good amount of use, it may start to develop cracks that don’t look appealing at all. Another disadvantage is weight: while super shield weighs only 2.1 pounds, blimp weighs 2.8 pounds and when holding it on a pole it actually feels heavier. Rycote shield is more expensive but it also has replaceable front and rear rod parts. I want to know one thing, do you think that there is a sensible difference in audio between the NTG3 and the mke 600 for voice recording in short distance (not exceed 3/4m) ? Definitely yes – MKE 600 is considered an entry shotgun; NTG3 on the other hand is comparable to higher tier Sennheisers. To state the obvious, NTG3 is quieter in terms of noise and the audio is altogether cleaner. In typical circumstances, you may not necessarily hear an audible difference and can probably achieve good results with either. 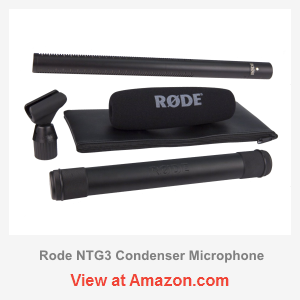 But if you want the best quality all the way, then it perfectly makes sense to use a professional mic – among which, NTG3 is actually on affordable side… the upper price range is around $2,000. Thanks Keep in mind, there is a huge difference in power consumption between externally polarized and electret condenser capsules. I for one doubt NTG3 would last more than 1 hour alone [ with your Zoom H5 recorder ]. Maybe in your case it’s better to go for the old MKH 416, which is more expensive but certainly lasts much longer. Just bought my second one. fantastic microphone indeed! Reading through all of this is very helpful. I’m trying to source professional grade ambient mics for corporate event spaces. The issue is that in at least one of the rooms, the mics get mounted 20 ft or so in the air. We have a significant HVAC issue in that room, which is why we’re looking to shotgun mics to provide better ambient response. Do you think the NTG3 would be suitable for that purpose? Although there is no ideal solution to this yes, using a directional mic would help a ton. If you are in a spacious room it wouldn’t hurt using a shotgun unless your are close to a ceiling, because of exposure to reflections from the rear. However, with longer distance shotguns also introduce a bit of comb-filtering, so I would rather use Audix SCX1-HC. But if high-pitched noise is the problem, then actually go for NTG3 – specific to your case, it will be a good compromise. The use of shock mount is not obvious for stationary mics, but if you are dealing with strong vibrations they could reduce the rumble noise.